As we wrap up another bountiful harvest, we're taking a breath, slowing down for a moment, and turning our attention to the upcoming holidays. We hope you'll join us in taking a few minutes to reflect on the past year before diving into the busyness of the holidays. For the adults on your shopping list, we're happy to present our holiday gift sets. 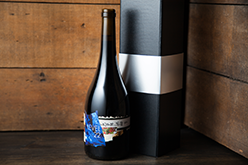 Create your own combination of library, limited release and newly released wines in a beautiful gift box. Don't forget - ONX Collective Six Bottle members benefit from inclusive shipping anywhere in California. Add the Two Bottle Gift Box to your cart and select two bottles of your choice. one bottle of your choice. Make your holiday gift selections by clicking here, responding to this email or calling us at 805-434-5607. If purchasing online, be sure to sign in using your member credentials to utilize your loyalty discount. Be sure to select your preferred shipping date and include a personal note. We will take care of the rest. We hope these gifts will brighten your holiday season.